I was a Benjamin Peirce fellow in the Harvard math department, but I moved on to work in quantum computing at Rigetti. Back when I was a pure mathematician, I focused on homotopy theory, especially the connections between algebraic topology and algebraic geometry known as "chromatic homotopy theory". In addition to research, I was very interested in the communicative aspects of the field, and I spent a lot of time learning how to coax my topologist peers into speaking in terms of number theory. Before any of that, I was a graduate student at Berkeley under Constantin Teleman. Before that, I was an undergraduate in computer science at Urbana-Champaign, under Matt Ando and Elsa Gunter. You might also be interested in my partner's website, ThisIsSam. Also, this URL used to host a group research blog, Chromotopy. My mathematical interests are in using algebro-geometric tools to answer questions in algebraic topology, and I have a penchant for computations. Fixed-depth two-qubit circuits and the monodromy polytope, with Gavin E. Crooks and Robert S. Smith. arXiv preprint available. Unsupervised Machine Learning on a Hybrid Quantum Computer, with J. S. Otterbach et al. arXiv preprint available. The homology of inverse limits and the algebraic chromatic splitting conjecture, with Tobias Barthel, Agnès Beaudry. In preparation. Coalgebraic formal curve spectra and the annular tower. Pending, submitted June 29, 2017. Cocycle schemes and MU[2k, infty)-orientations. Contemporary Mathematics, v. 707 (2018) 77-88. A relative Lubin–Tate theorem via higher formal geometry, with Aaron Mazel-Gee and Nathaniel Stapleton. Algebraic and Geometric Topology, v. 15 (2015) 2239-2268. A 2-Local Classification of Symmetric Multiplicative 2-Cocycles, with Adam Hughes and JohnMark Lau. Journal of Pure and Applied Algebra, v. 217 (2013) 393-408. A Classification of Symmetric 2-Cocycles, with Adam Hughes and JohnMark Lau. Illinois Journal of Mathematics, v. 53.4 (2009) 983-1017. An Expanded Ambient Calculus with a Pi-Calculus Embedding, with Elsa Gunter. Finished but unpublished, to be incorporated into a larger paper with Elsa, May 12th, 2009. Formal Geometry and Bordism Operations. Course notes, now available as a book through Cambridge University Press. On certain groups of unitary operators. English translation of Andre Weil's 1964 original. 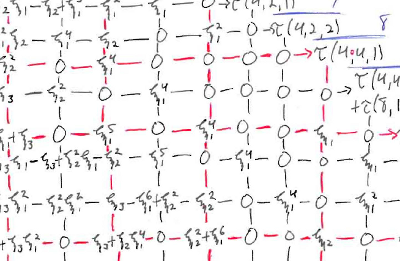 MIT E-theory Conjectures Seminar notes, with Mark Behrens, Drew Heard, Mike Hopkins, Geoffroy Horel, Tyler Lawson, Jacob Lurie, Tomer Schlank, Nat Stapleton, and Sebastian Thyssen. Transcript of contributed talks to the 2013 spring seminar, August 14th, 2013. Vector Fields on Spheres, etc., with Haynes Miller and Matt Ando, course notes. In preparation, incomplete draft available; rife with typos and poor typesetting, and missing spectral sequence diagrams. See also: Haynes-Notes github repository, as well as Haynes's revision. Computations with spectral sequences. Barely started book project. I passed my qualifying exam on November 23rd, 2011. Here are my qual syllabus and transcript of the exam questions I could remember. Here is an unedited copy of my PhD thesis. Beware: this document contains several significant errors. Readers should consult the published version for the original research and the book project for the exposition. I'm not very active, but I have also written some things on MathOverflow. Also, here are two animations of the stabilization of the unstable Adams spectral sequence for the sphere, at the prime 2 and at the prime 3, due to Barnes, Poduska, and Shick. I've given a good number of talks, and I was often funded through a teaching position. Students and onlookers can find both talk notes and course pages below. quilc: The Rigetti quantum compiler. 2nd International Workshop on Quantum Compilation, November 8, 2018. Construction & deconstruction of two-qubit gates, with Gavin E. Crooks. Tuesday Technical Seminar at Rigetti, August 21, 2018. Faithful-ish algebraic models for homotopy theory. Gammage Seminar, July 12th, 2018. Robert Langlands: Abel Laureate 2018. Tuesday Technical Seminar at Rigetti, May 1st, 2018. (slides). Topological Modular Forms: Construction and Computation. European Talbot Workshop on Dualities in Algebra, Geometry, and Topology, June 15th, 2017. Efficient Occupation Count for Certain Probabilistic Fermionic Motion. Rigetti Computing, May 10th, 2017. Bordism: An introduction and sampler. Graduate Student Topology & Geometry Conference, April 2nd, 2016. Spectra and G-spectra. Juvitop, September 23rd, 2015. Introduction to E-theory. Flavors of Cohomology workshop, June 3rd-5th, 2015. Some formal geometry around K-theory. Stanford topology seminar, October 29th, 2014. Algebraic topology and algebraic number theory. Graduate Student Topology and Geometry Conference, April 5th, 2014. Operadic Koszul duality. Berkeley Koszul Duality seminar, November 21st, 2013. Determinantal K-theory and a few applications. Johns Hopkins topology seminar, November 11th, 2013. Recurrences in Thom spectra. xkcd seminar, November 5th, 2013. Arithmetic and complex bordism. Pre-MSRI semester seminar at UC-Berkeley, October 15th, 2013. Spectra and stability. Pre-MSRI semester seminar at UC-Berkeley, September 10th, 2013. Differentials in a May spectral sequence are topological. MSRI workshop on algebraic topology, June 28th, 2013. The Morava K-theories of Eilenberg–Mac Lane spaces. Talbot workshop on chromatic homotopy theory, April 25th, 2013. Tangent spaces for certain spectra. UIUC topology seminar, January 22nd, 2013. BRST quantization of a relativistic point-particle, with Kevin Wray. Mini-conference on quantum field theory, December 3rd, 2012. On Beyond Hatcher!. Berkeley topology seminar, November, 2012. Taylor towers for homotopy functors. Goodwillie Calculus Arbeitsgemeinschaft at Uni-Bonn, April 19th, 2012. Extraordinary homotopy groups. xkcd seminar, November 15th, 2011. Spectral sequences from co/simplicial objects. xkcd seminar, September 20th, 2011. Cotangent sums and the G-signature theorem. Mini-conference on the Atiyah-Singer index theorem, May 16th, 2011. Morava E-theory of Eilenberg–Mac Lane spaces. REGS project report, August 2nd, 2010. Group cohomology and topology: using slinkies to understand addition. Pi Mu Epsilon talk, February 18th, 2010. Additive and Multiplicative Cocycles and Singer's Calculation of the (Co)homology of BU's Connective Covers. AMS Special Session in Algebraic Topology held in honor of Bill Singer, October 11th, 2008. Spring 2017: 231b: Advanced Algebraic Topology: main course website. Spring 2017: 25b: Honors Linear Algebra and Real Analysis II: main course website. Fall 2016: 25a: Honors Linear Algebra and Real Analysis I: main course website. Spring 2016: 130: Classical geometry: main course website. Spring 2016: 278: Formal geometry in bordism theory: main course website. Fall 2015: 1b: Calculus, Series, and Differential Equations with Prof. Gottlieb (email, website), section TBA: main course website, section website. Summer 2015: 53: Multivariate Calculus with Prof. Hutchings (email, website), section W: main course website, section website. Fall 2013: 55: Discrete Mathematics with Prof. Evans (email, website), section 109, 110: main course website, section website. Fall 2012: 1A: Calculus I with Prof. Borcherds (email, website), section 111, 113, 114: main course website, section website. Fall 2011: 53: Multivariate Calculus with Prof. Frenkel (email, website), section 205, 209: main course website, section website. Spring 2011: 54: Linear Algebra / Differential Equations with Prof. Gu (email, website), section 211, 212: main course website, section website. Fall 2010: 1B: Calculus II with Prof. Jones (email, website), section 210, 212: main course website, section website. Spring 2010: 231: Calculus II with Prof. Bronski (email, website), section BD5, BD6: main course website, section website. Fall 2009: 221: Calculus I with Prof. Leininger (email, website), section BD1, BD2: main course website, section website. quilc: A retargetable compiler for gate-based quantum computers. Part of Rigetti's Forest SDK. Atlas: A real-time, collaborative "mind-mapping" program, designed to be useful for storing a mathematical research program. Here is a public Atlas server, as well as a video demoing its features. Ext Chart: A utility in development for OS X, useful for drawing and computing with spectral sequences. Op: A rewrite system in Mathematica to determine the closure of a set of cohomology classes in H^*(K(Z, n); Z/2) under the action of the Steenrod algebra. Useful for expanding Singer's and Stong's calculations of H^*(BU<2k>; Z/2). Coact: Mathematica package for computing the free and square-zero parts of the coaction of the dual Steenrod algebra on the space of multiplicative k-variate cocycles. A-cocycles: Mathematica package for computing the space of additive cocycles, along with some of the tertiary invariants described in our paper. A-visual: Mathematica notebook with some graphical routines, displaying some of the tertiary invariants in our paper. Used in a presentation to Stephen Wolfram. M-cocycles: Mathematica package for computing obstructions to free extension from the tangent space of multiplicative cocycles to the total space. Doesn't completely work, but it's close, and it's complete enough to warrant sharing. Missing backtracking, mostly. Agenda: A small agenda program, written in OCaml, to keep track of deadlines and so forth, though its feature list has grown marginally from those beginnings. Smithy: A map editor, also written in OCaml, for the Marathon engine, a game from the mid '90s now actively developed under the name Aleph One. MW2: A small collection of thoughts on reverse-engineering some of the engine and data pieces in Activision's classic MechWarrior 2.